Happy St. Maewyn’s Day, everybody! 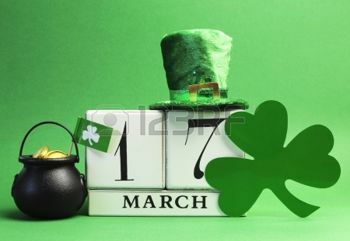 DID YOU KNOW that according to Irish legend, St. Patrick’s birth name was really Maewyn Succat? Catchy, huh? Saint Patrick changed his name to Patricius after becoming a priest. If he were alive today, how many handles would he have on Twitter? DID YOU KNOW that we should really wear BLUE on St. Patrick’s Day? His color of choice was a light shade of blue. Green didn’t become linked to the holiday until the Irish Independence day movement in the late 18th century. DID YOU KNOW that St Patrick was British? His claim to fame came from introducing Christianity to Ireland in the year 432, but he wasn’t Irish. He was the son of Roman parents from Scotland or Wales. WHO CELEBRATES ST PATRICK”S DAY MORE SERIOUSLY? This is harder to quantify. Of course the Irish celebrate in a huge way by making it a national holiday. New Yorkers have a HUGE parade, one of the largest parades ever since the mid 1700s, but this parade to this day does not allow floats, cars, or other modern conveyances. But Chicago won’t be denied. They dump vivid green dye into the Chicago River, since 1962, and it takes 40 tons of dye. DID YOU KNOW St. Patty’s was strictly a religious holiday in Ireland for most of the 20th century and the nation’s pubs were closed to celebrate? The one exception for alcohol was the national dog show held on the same day. In 1970, the day was made a national holiday and the beer flowed. Yes, that day, the holiday went to the dogs. WHAT”S UP WITH THE SHAMROCKS? According to legend, the saint used the 3-leafed clover to describe the Holy Trinity. There’s nothing like a visual. DID YOU KNOW St. Patrick was the Pied Piper of Snakes? The Irish might be full of blarney on this one. St. Patrick gets credit for driving all snakes out of Ireland, but scientists and fossil records claim Ireland has never been a refuge for snakes. It’s too damned cold and the surrounding seas make a natural barrier. Unless snakes come in on a plane, those slithering varmints are banished. DID YOU KNOW THERE ARE NO FEMALE LEPRECHAUNS? Whaddup with that? In traditional Irish folk tales, there are no lady wee people, or snappy dressed little guys for that matter. DID YOU KNOW that the phrase “Erin go Bragh” is NOT the correct pronunciation? It should be “Éirinn go Brách” which means “Ireland Forever.” So get it right, people. Some things are just mysterious and beyond out comprehension.Thanks. Cheers! How did the charts every know that? It’s amazing! Thanks. I didn’t know that! I really cannot pronounce the name….LOL…cheers!